Did you know that indoor air pollution can cause serious health problems? 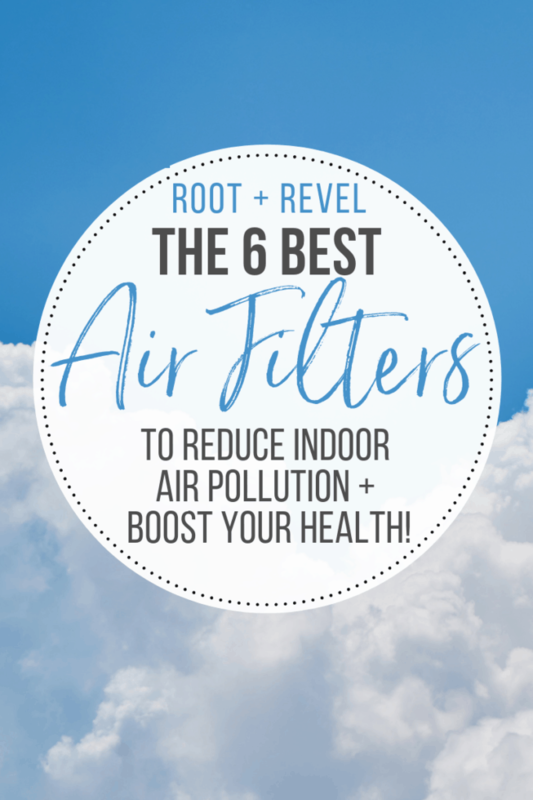 In this ultimate guide, we outline how to improve air quality and reduce air pollution in your home, what to look for when buying an air purifier, and share personal reviews of the best air filters, dehumidifiers and humidifiers–plus we are giving away $1,500+ from some of our favorite brands!! 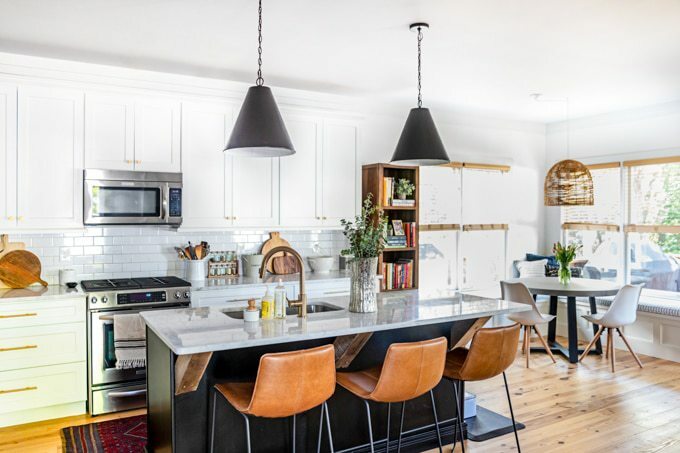 Public Service Announcement: The air inside your home may look clean, but it’s almost guaranteed to actually be filled with toxins, allergens and pollutants that have serious health repercussions. I know, I know… you’re probably thinking: Kate, seriously? ANOTHER thing I now have to worry about? It can’t be that bad, can it? I’m pretty sure my home is clean and safe. Isn’t indoor air pollution a bunch of hype? Nope. Just because you’re not living in a constant state of indoor smog doesn’t mean that your air is clean. In fact, indoor air can be 5 times more polluted than outside air (even with icky things like car exhaust, factory combustibles, and gasoline lurking around outside) due to everyday factors like paint, furniture, carpet, air fresheners, plastics, cleaning supplies, toys, smoke, other common household items and wet environments that release harmful pollutants into our indoor air. 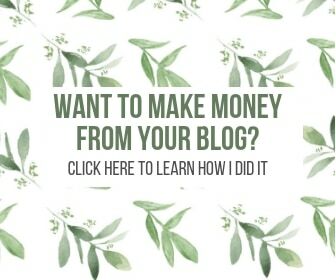 Sorry to be the one to break it to you, but as a health blogger and journalist, it’s my duty to tell you the tough truths so you can actually do something about it, and know what to do to protect yourself and your family from harm. As we spend about 90% of our day indoors, it is absolutely critical that we take indoor air pollution seriously. The good news is that with a high-quality air filter–and dehumidifiers or humidifiers as needed–we can drastically reduce our exposure to air pollution and continue on our merry way. No popping supplements, expensive doctor visits or drastic lifestyle changes necessary, whoop! 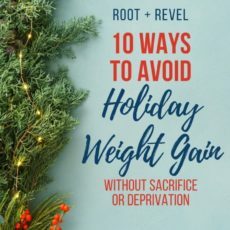 I’m warning you now: this guide is a doozy. To say it’s comprehensive is an understatement–it includes research about the common dangers in our air, a FAQ and THEN we get to the shopping guide itself. 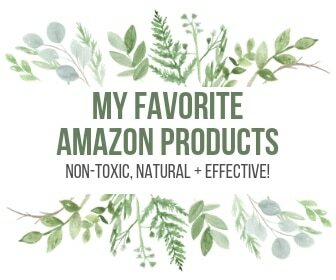 After researching and personally testing out a variety of different brands, we’ve listed the key points so that you can compare, contrast and pick the products and budget that works for you! Oh, AND we’ve got an amazing giveaway at the end of this post with over $1,587 worth of air filters and dehumidifiers from top brands!! Intro: What are the Health Effects of Air Pollution? Indoor air pollution is caused by a combination of particles–pollen, dust, pet dander, mold spores and smoke–combined with invisible gases like ozone and volatile organic compounds (VOCs) which are emitted by building materials, furniture, carpeting, paints, your kitchen range, fireplace, heaters, candles, cleaning products (scrubs, laundry detergents, disinfectants, furniture polish, and ironically air fresheners) and personal care products (hairspray, nail polish). This fine dust or Particle Matter–also known in sciency worlds as “PM2.5”–is so small, it can’t be seen by the naked eye; a single particle has a diameter of less than 2.5 micrometers. For perspective, this means you can easily fit 40 PM2.5 particles across the width of a single strand of hair. Unlike larger dust particles, PM2.5 are able to bypass your nose and throat and be absorbed by your lungs and bloodstream. Think about it: every day we breathe 15,000 liters of air, and any toxins in that air pass through our lungs, then are circulated to the heart, liver, kidneys, brain and other organs. Not only that, but throughout our days we add hazards into the air. Did you know vacuuming can actually add dust and dust mites into the air? Poor indoor air quality can be particularly harmful to vulnerable groups such as children, the elderly, or those already suffering from chronic respiratory, auto-immune and/or cardiovascular diseases–so if this is you or anyone you live with, investing in a high-quality air filter is really non-negotiable! Also, if you’re already prone to pet allergies, or seasonal allergies like pollen, or if you have asthma, having air purifiers will make a massive impact on your symptoms. Even if you personally don’t fall into these especially susceptible groups, the air you breathe can actually have a big effect on whether or not you get sick, and how severe your illness will be. Multiple studies have confirmed that exposure to elevated levels of air pollution increases not only the likelihood that you will become sick with the flu or common cold, but also that your symptoms will be worse when the air is polluted. (source) Ain’t nobody got time for being sick! Have I made my point? Hopefully you’re seeing by now that the science here is no joke and you really need to take your indoor air quality seriously! Q: What should I look for when buying an air filter? You definitely want a HEPA (High Efficiency Particulate Air) filter. True HEPA filters must meet strict standards set by the U.S. Department of Energy, such as removing 99.97% of particles measuring down to 0.3 microns. This includes tackling all kinds of contaminants, such as dust, mold spores, VOCs, and more. All the air filters listed in this post feature at least a standard HEPA filter. If you want an objective measurement to compare different air filter performance, check out the Clean Air Delivery Rate (CADR), which measures the volume of clean air that is produced by an air purifier per minute. This rating indicates how well pollutants are removed from the air you breathe and is certified by an independent laboratory, the Association of Home Appliance Manufacturers (AHAM). The higher the number, the more effective. Also be sure to check the square foot coverage of the filter you’re buying, since some cover quite small areas while others can cover large living spaces. Finally, look for additional features that may be important to you, like if it’s Energy Star Certified, or has an auto sensor, or connects to wifi through an app, or if it has an indicator light when the filter needs to be changed. Q: Do I need an air purifier in all rooms of my house? Technically, yes, that’s the ideal solution. However, if you’re on a budget, we recommend starting with a filter in your bedroom, since that’s where you spend 1/3 of your time, and getting good quality sleep is so important! Most filters are pretty small so if you just start out with one you could move it around from time to time, like into your living room when you’re hanging out in that space, or when you’re vacuuming to help clean the air right away so you don’t breathe as much of the pollutants in. Again, check the square foot coverage of the air filter, as some of the smaller, more affordable units might be enough to adequately cover your bedroom. Q: How do I know if I need an air filter? You always need an air filter, as that’s what’s removing hazardous particles and gases from the air you breathe. But to determine exactly what your air quality is and what filter might be best, I recommend this amazing air quality monitor called Awair. Awair’s sensors are tested to accurately identify the five key factors of air quality: temperature, humidity, Co2, chemicals and fine dust, and provide your air with a score from 0-100. With the app you can track your improvement over time and learn how your actions affect your air quality. 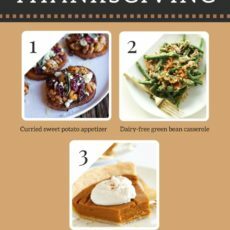 It also offers various preference modes to help you sleep better, control your allergies, increase productivity, or improve your general health. Awair also gives you personalized tips and recommendations to help you take control of your environment, so if you have an air filter without a built-in monitor (like the BlueAir), this device is a great add-on. It also connects with other smart products (Nest, Ecobee, Alexa, Google Home) to help automate the process of air quality management. How do I know if I need a humidifier or dehumidifier? You’ll want to keep tabs on your humidity levels. Too much or too little moisture leads to cold and flu symptoms, allergies and risk for toxic mold. Humidifiers are generally more necessary during the winter, when atmospheric humidity levels are low. Additionally, heating systems also dry the air out, creating a double whammy for dryness between these indoor and outdoor factors. 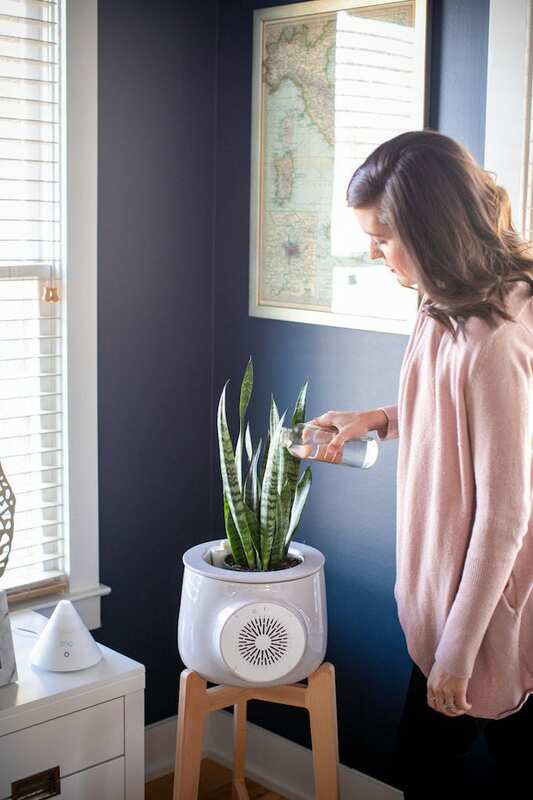 Humidifiers can also help keep houseplants, wooden floors, and furniture in good condition. Dehumidifiers are necessary in warmer months, in moist, coastal or tropical climates, or in areas prone to dampness or flooding, like basements or storage closets. They absorb excess moisture from the air to prevent mold and mildew from growing on walls, showers, clothes, shoes, etc. Q: How do I measure humidity levels in my house, and what’s the ideal range? Levels can be monitored with a device called a hygrometer, and many humidifiers and thermostats have them built in. Below 25%: we feel uncomfortably dry or itchy, experience chapped lips, cracked hands, irritated eyes, etc. 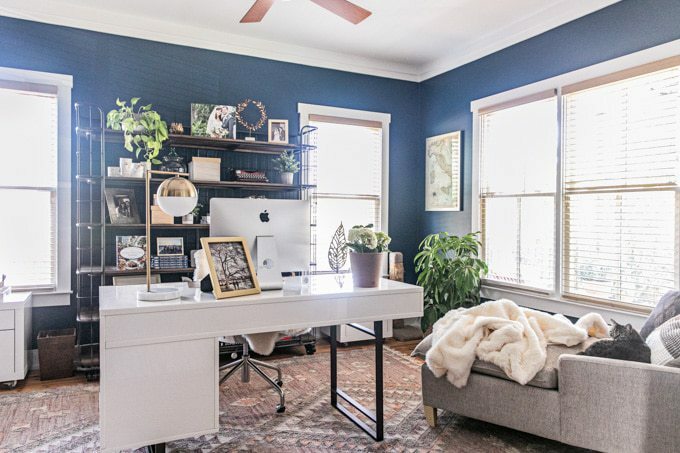 Alright, now that you know why investing in an air filter, dehumidifier and/or humidifier is so critical, let’s check out our guide to the best air filters! 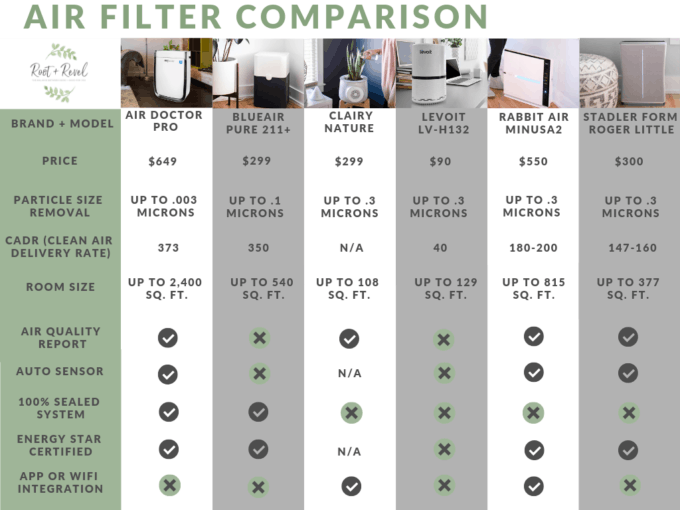 A lot of the top experts in the health field like Deepak Chopra, Mark Hyman and David Wolfe recommend the AIR Doctor Pro because it’s one of the only air purifiers that not only removes almost 100% of particles like dust, pollen and pet dander, but also the vast majority of toxic ozone, volatile organic chemicals (VOCs) like formaldehyde, and gases. It’s known for its UltraHEPA™ Filter that’s 100 times more effective than ordinary HEPA filters, able to capture 99.99% of the most dangerous ultrafine PM2.5 particles including germs and viruses down to .003 microns. In fact, 90% of PM2.5 are actually smaller than .1 microns–meaning that ordinary HEPA systems can’t reach these super tiny particles as they can only trap down to .3 microns. 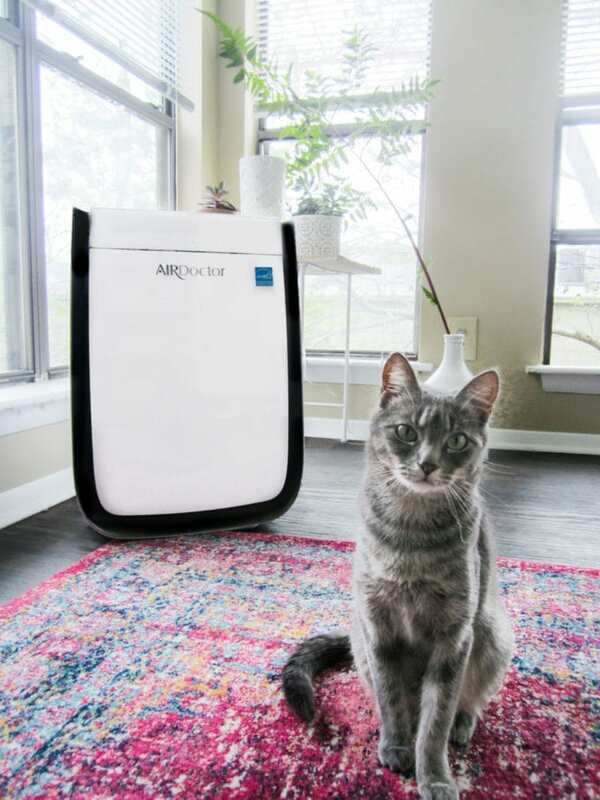 They’ve got a high Clean Air Delivery Rate (CADR)–one of the best rates of all the models we tested–plus the AIR Doctor works up to 2,400 square feet, making it suitable for large living spaces! What we love most about it: The AIR Doctor Pro is one of our favorite filters we tested for its effective UltraHEPA filter. Plus, it has an additional filter for VOCs. Most air filters are designed to only capture particulates OR gases, but this does both! The AIR Doctor Pro is also a 100% sealed system, which ensures that ALL of the air you breathe is pure and filtered, which many other models don’t have (meaning there can be leaks inside the machine where air actually avoids the filter and thus passes through the other side unfiltered). 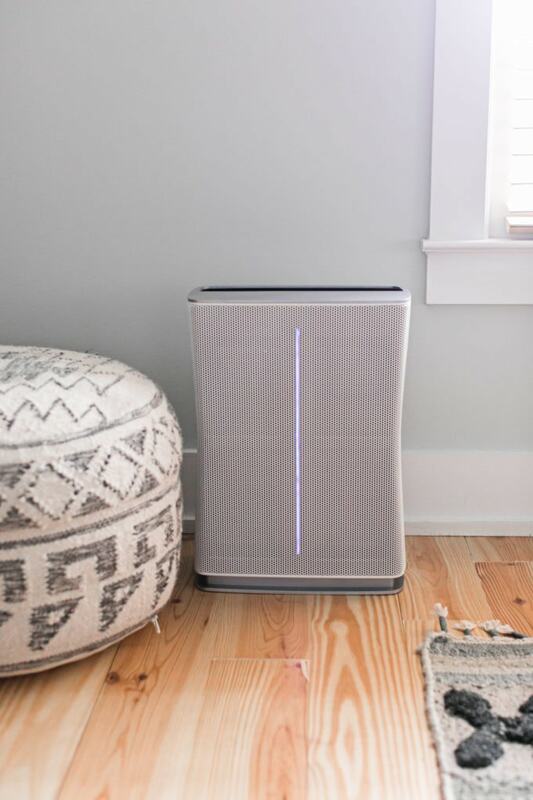 Plus, this air filter was the only one we tested that also has a built-in air ionizer option, which helps remove particulates, microbes and odors from your room–leaving it smelling fresh. The biggest downside is that there is no wifi integration for any techie folk who want that feature. Cost: Normally, $629, but with our link, you’ll get yours for just $329 PLUS 2 free filters. Where to buy: Our friends at Air Doctor Pro put together a special offer for R+R readers! Through April 30th 2019, get $300 off + 2 FREE air filters ($80 value!) when you shop here. That means you’ll save $380 and be set with air filters for a minimum of 1 year! For this story we tested the MinusA2 SPA-780N, which allows you to customize what filters you want. I picked the Toxin Absorber as it traps VOCs, exhaust fumes and other chemical compounds, but you can also pick Germ Defense, Pet Allergy or Odor Remover. The MinusA2 is also wifi enabled for iOS and Android, so you can do things like set a schedule and keep tabs on your air quality. What we love most about it: I loved having the auto-sensor on this filter, as it intuitively knew when we needed more powerful filtration and when our air was clean. There was no monitoring on my part–as soon as the air quality in my home decreased, the Rabbit Air automatically kicked into high gear and gave me indications of the air quality with colored lights. I loved being able to see it really working–especially when we were cooking!–as it works in up to 815 square feet. The awesome features mentioned above like customized air filters and adding art to the panel are truly unique to Rabbit Air. The filter also has a remote, built-in deodorization, and can even be hung on the wall if you need to conserve floor space! The biggest drawback is that even their best unit has a fairly low CADR compared to other top brands (scoring 180-200), and the filter is not as powerful with the standard HEPA .3 microns compared to AIR Doctor Pro and Blueair’s more advanced filters. With a stylish design, this energy efficient air filter utilizes a 360° air intake, allowing air to be drawn in from all directions to effectively filter out impurities. It has an added active carbon filter which helps removes odors, gases and VOCs. We tested the Blue Pure 211+, which removes up to 99% of airborne particles up to .1 microns like pollen, dust and pet dander and it comes in five sleek colors (you choose the colored fabric pre-filter that’s shown on the outside of the unit–grey is pictured above) so you can be sure to find a color that fits in with your décor! This specific model is designed for rooms up to 540 square feet making it ideal for a bedroom, office, dorm or smaller living area. What we love most about it: Blueair is definitely an awesome brand with a variety of models to choose from depending on your needs. They’re one of the best brands for quality since the CADR rating for their largest units is super high (scoring a 400), and with a particle size elimination of .1 microns, it’s definitely an improvement over most other regular HEPA filters. Like AIR Doctor Pro, Blueair has a 100% sealed system, meaning ALL of the air you breathe is pure and filtered. A really unique feature is that their filters are made of ultra-thin polypropylene fibers–a.k.a. environmentally responsible synthetic–which breaks down into carbon dioxide and water when properly disposed of, so this is a nice eco-friendly upgrade! Polypropylene also prevents bacterial growth as their filters capture bacteria and mold from the air, without it growing inside the filter. Blueair also has its own app that informs you in real time about outdoor air quality in your area and recommends what measures you can take to stay healthy. Through the app you can automatically control functions on certain Blueair models, such as the on/off, operating speed, LED light, child lock and night mode, though it doesn’t measure air quality indoors. The biggest drawback to Blueair is that there is no automatic sensor that adjusts fan speed accordingly, at least not on the model we tested. You may have heard of the NASA study where they found that some plants are able to eliminate toxins from the air through their roots. 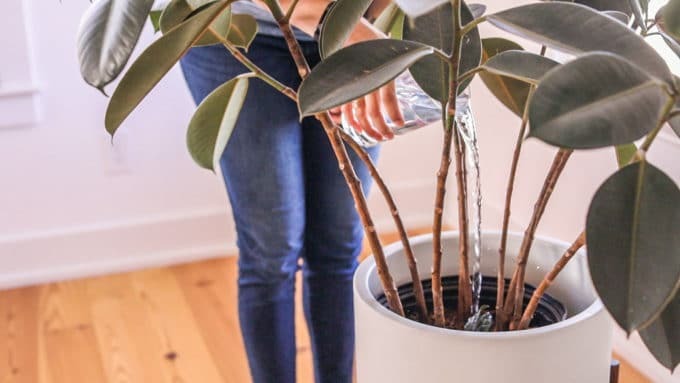 Inspired by this, Clairy invented an advanced filtration system that boosts plants’ natural pollution-reducing abilities to help you kick pollution out of your home. So how does it work? Clairy is a filtration system with a self-watering filtering system that exponentially increases air passage through the plant where–thanks to the combined action of microorganisms in the soil associated with the roots of the plant–harmful substances in the air are actually converted into nourishment for the plant itself. Incredible, right?! To top it off, Clairy has built-in air quality, temperature and humidity sensors that integrate with their app to report levels of indoor air pollution in real time. 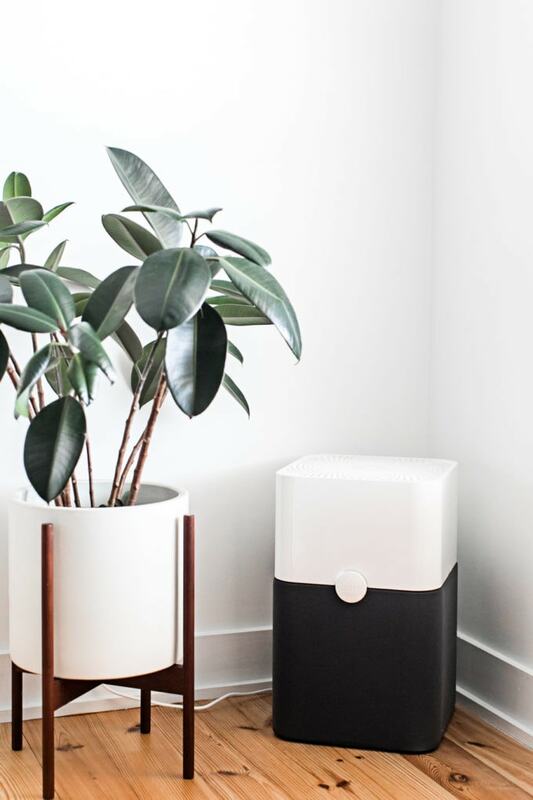 What we love most about it: Definitely the prettiest and most unique of all the air filters we tested, this system combines function (plant-powered detoxification) with style and natural beauty (gorgeous, elegant Italian ceramics). We love how each Clairy is a one of a kind piece of art, handmade with the traditional techniques handed down for generations. Yet it’s still a super clean and modern addition to any room in your home, especially with its smart wifi integration. This may be the most cost-effective filter listed in this post, since you never have to buy replacement filters, unlike all the other machines that need replacements about every 6 months – 1 year. However, note that the plant itself is NOT included, so you need to buy this too (we have a snake plant pictured above which cost us $12.99 at a local nursery). It’s also completely silent, unlike other filters; even though many of the brands listed in this post have Whisper Technology, none of them can boast total silence like the Clairy. The biggest downsides are the room size capability, coming in at 108 square feet, which is pretty small compared to other options; also the particle size removal is .3 microns, which is great and in-line with HEPA standards, but it’s just not quite as powerful as the AIR Doctor and Blueair brands. Stadler form is a Swiss company specializing in all things air. Their air purifiers feature a Dual Filter–HEPA plus activated carbon for removal of odors and harmful gases. We tested the Roger Little for this story. Like standard HEPA filters, this machine removes particles up to .3 microns, and includes handy features like a color changing air quality indicator. What we love most about it: I enjoyed the sleek, simplified design of this machine that blended perfectly into our master bedroom’s modern farmhouse decor, and was the perfect size since it covers up to 377 square feet (their largest model–the Roger–covers up 797 square feet). It has a flat control panel on top that illuminates when being adjusted, but then disappears after to avoid excess light pollution, which is a small detail that I really appreciate! The extra activated carbon filter is really nice and helps with odor control, which is super helpful since we keep our litter box in our master bath. Once again, I love that this filter also has an auto-sensor and ramps up its power when air quality decreases. And I love that it provides air quality analysis with colored lights that indicate how clean your air currently is. The biggest drawback is that even their best unit has a fairly low CADR compared to other top brands (scoring 147-160), and the filter is a standard HEPA, which is great at capturing down to .3 microns, it’s just not quite as powerful when compared to AIR Doctor Pro and Blueair’s more advanced filters. Where to buy: At big-box retailers like Overstock or Bed Bath & Beyond, on Amazon, or use the code Root20 to get 20% off when you buy direct on Stadler Form’s website! All of Levoit’s air purifiers feature a 3 Stage Filtration System: pre-filter, TrueHEPA filter, and activated carbon filter. The first preliminary filter helps neutralize airborne bacteria, pet dander, mold, and fungi. The TrueHEPA filter then traps dust mites, large particles, and pollen down to .3 microns. The last stage–the activated carbon filter–purifies various household odors such as cooking smells, pet odors, and cigarette smoke. Levoit’s machines are also 100% Ozone free, meaning they don’t use UV or ions that produce trace amounts of measurable ozone, a harmful air pollutant. Looking for a smart machine? 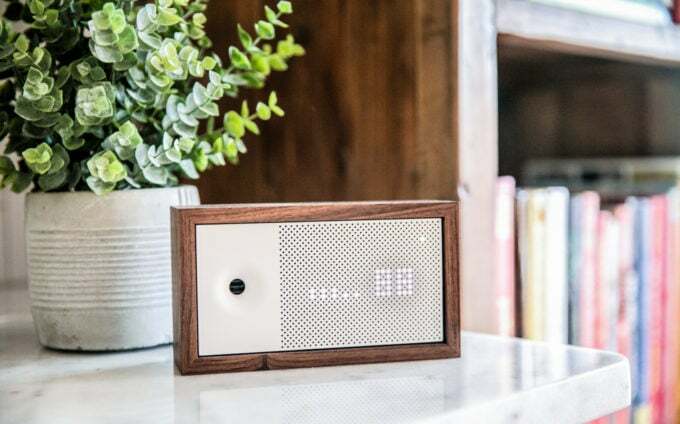 Their newest model, the LV-PUR131S, connects to a free app where you can remotely adjust fan speeds, turn the air purifier and LED display on/off, create schedules and timers, and track your filter life. What we love most about it: We tested the LV-H132 for this review. It’s quiet and compact, making it a great choice for small offices or bedrooms. At the time of publication, this model is on sale on Amazon for $76.49, making it a great, budget-friendly option! We also love the activated carbon filter–Sarah from the R+R team who owns this filter said that she’s noticed her old and sometimes musty smelling apartment has started to smell more neutral since having this air filter running 24/7 in her living room. Cheers to that! The biggest drawbacks are, once again, the particle size; while HEPA is great at .3 microns, there are now machines even more powerful. There was also no auto sensor on the model we tested. Using their patented Ultraviolet CleanseTM technology, every drop of water in the Dyson Cool Mist Humidifier is exposed to ultraviolet light twice to kill 99.9% of bacteria before distributing the mist evenly around the room, ensuring that the moisture you’re adding to the air is clean and safe. It can run for up to 18 hours of continuous use in a 172 square foot room with its 1.7-gallon tank. The machine has intelligent climate control, automatically adjusting for temperature and humidity to create a comfortable environment. It also features dual functionality–it evenly distributes humidification in winter and uses high-velocity air to cool you down in summer. What we love most about it: We love the hygienic focus of the Dyson; knowing it kills bacteria before distributing moisture into the room is a huge plus! The magnetic remote is also a convenient feature, we often use it from our bed for ultimate convenience as we keep ours in our bedroom. The high-tech, modern design is another bonus! 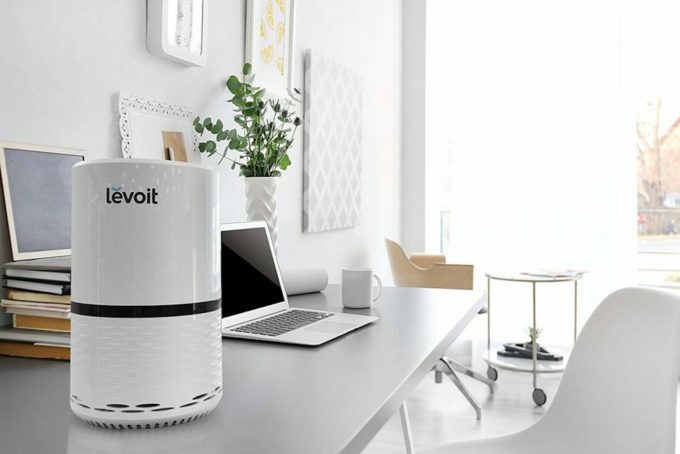 With a simple and modern design, Levoit humidifiers all have at least a 4.5 liter capacity, meaning it can support up to 36+ hours of continuous use in up to 750 square feet. Some of the models offer both cool and warm mist options, making them conveniently multipurpose depending on the season and your personal needs. These machines are super quiet and can even be transformed into an aroma diffuser by adding a few drops of essential oil into the aroma box, unlike any of the other models we tested. So very cool! What we love most about it: We tested the LV550HH Hybrid Ultrasonic Humidifier for this story, which is unique in that it offers BOTH warm and cool mist options. The gentle, warm mist is known to deter growth of harmful bacteria, dust mites, and mold, and also relieve cough, irritated nasal passages or throat; the cool mist keeps nasal passages, sinuses, and skin hydrated in hot, dry weather. Having both options makes this a great year-round machine! 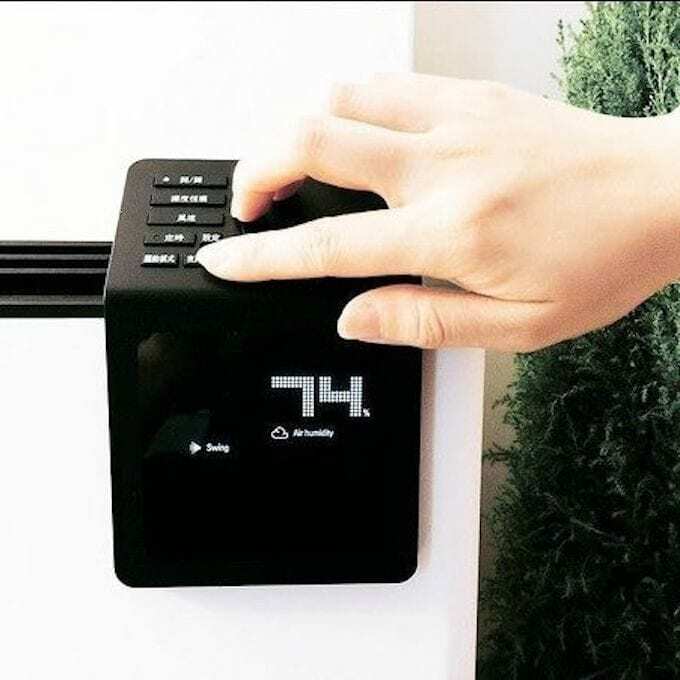 This model also has a lot of convenient features like a remote, timer, humidity level and temperature displays, and you can even program a specific humidity level you want to maintain in the room. We keep this humidifier in Jackson’s nursery and I love that I can set it to always keep humidity levels at 55% so that the air in his room is always perfect, especially with it’s large and long-lasting coverage. Eva-Dry is the market leader in green, eco-friendly dehumidifiers. While they offer more traditional, electric units that plug into the wall and capture excess water particles, they also created smaller, renewable dehumidifiers that don’t use electricity or batteries–they’re simply made from odorless, absorbent silica gel crystals that eliminate mold, mildew and moisture. How does it work? Once the crystals have absorbed their maximum moisture, the indicator window on the front of the unit turns green to tell you that it is time to renew the system by drying it out. Then, just plug the dehumidifier into a wall outlet and the renewing process will begin. After just a few hours it will dry out and be ready for use again, and has a 10-year life! You’ll never need refills and there is nothing to throw out that will take space in a landfill or damage the environment. Unlike many dehumidifiers on the market, Eva-Dry Dehumidifiers don’t contain calcium chloride or create a mess. They’re safe for children, pets, and the environment, and are totally spill proof. What we love most about it: Sarah from the R+R team tested a variety of Eva-Dry’s products. Here’s what she said: “I absolutely love my Eva-Dry dehumidifiers! I live by the coast in an old building so am always concerned about moisture levels. I used the hygrometer to track my humidity and loved getting to see tangible numbers to know I’m within a safe range. Stadler Form’s Albert is a serious machine for anyone concerned about mold, be it in your basement, laundry room or any home by the water. It can remove up to 5.4 gallons of moisture per day with only a whisper-like hum. It’s got upgraded features like 3 speed levels, a unique 24-hour timer allowing you to program Albert’s operable time down to the minute, built-in auto-shutoff or–if you prefer–an optional hose for constant drainage. Live in a cold environment and want a dehumidifier for your garage or another cold space? Albert operates in spaces as cool as 41 degrees Fahrenheit and is equipped with an automated defrost mode. What we love most about it: Just like their Roger Little air filter, I enjoy the sleek, simplified design of Stadler Form’s products. The Albert covers a large area–up to 650 square feet–and is the perfect machine for insulated or uninsulated spaces alike. While we didn’t use the hose feature, I love how it has that option for ongoing drainage, as that’s quite handy for any super moist environments. Where to buy: At big-box retailers like Macy’s, Bloomingdale’s, or buybuy BABY, on Amazon, or use the code Root20 to get 20% off when you buy direct on Stadler Form’s website! 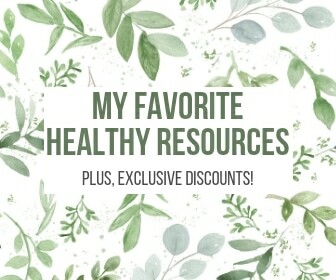 This wouldn’t be R+R without talking about other lifestyle factors and practical tips we can integrate to improve our air quality, so let’s quickly go over some suggestions, shall we? Go green. 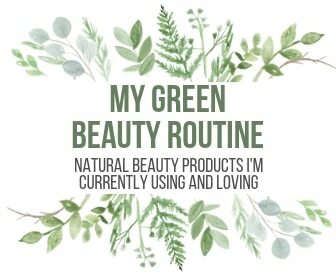 Switch all your cleaning products plus personal care and beauty products to natural, non-toxic options, and gradually work on purchasing eco-friendly and safe furniture, paints, mattresses, etc. that don’t off-gas or expose you to hazardous chemicals. Clean vents and filters. Clean your heating vents and change your furnace filter before turning your heat on for the first time each season. Regularly change out your air filters–both those in your home vents and those in whatever machines you purchase. Utilize the fan. Keep the fan on in your bathroom while showering and after so your shower curtain, walls, towels, and rugs can all dry properly. Likewise, use the vent fan on your stove while cooking. Rinse off. Shower before bed to get allergens brought in from the outside off your skin and hair. Also a good idea to take your shoes off inside. Ventilate properly. Open a window or door to get fresh air, especially if your kitchen gets a little smoky when cooking, or of course, if you’re doing projects indoors like painting. Allergy awareness. If you’re prone to allergies, check things like specific pollen or ragweed counts in your area, and stay indoors with windows and doors closed, especially in the morning when pollen is at its peak. 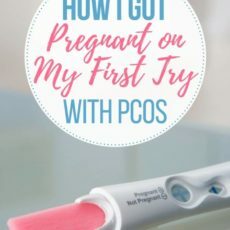 I love how this post is spreading awareness about this serious yet largely unknown health issue! It’s largely avoidable if we could fill our homes with non-toxic materials and have a good quality air filter, so yay for that!